The perfect house to spend holidays with the whole family or many friends ! 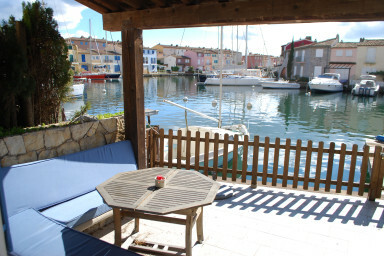 Big fisherman house on 4 levels close to the beach and the facilities in Port Grimaud 1. At the entrance, a wide terrace hidden from the street and an outside shower perfect for the returns from the beach. On the ground floor, a very wide living-room, a separate kitchen and guest toilets. On the first floor, one large bedroom with two single beds together and a shower-room, a second bedroom with two single beds together, a room down as a laundry with a washing machine and a dryer, a bathroom and separate toilets. On the second floor, one large bedroom with two single beds together, a second bedroom with two single beds together, a third bedroom with a single bed, a bathroom and separate toilets. On the third floor, a little bedroom with a single bed and a shower-room. On this upper floor, a large solarium with a wonderful panoramic view on Port Grimaud, the canal and even the sea. On the canal side, a terrace closed by a barrier leads to a 15m-long mooring with a pontoon. The perfect house to come with the whole family or many friends !